The time-traveling sub USS Janus returns to Agamemnon‘s realm. Lieutenant Zach Bacon and his fire team resume their aborted mission of discovering the history hidden within the Greek myths. 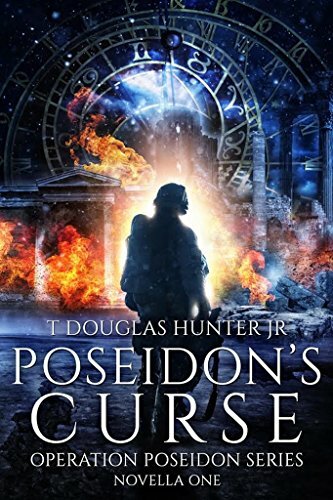 Their quest leads them into the lair of the Hydra, which holds a clue to a still deeper mystery: a legendary curse by Poseidon on the land of Argolis. Deep inside the cisterns of Tiryns, the home of Heracles, the four SEALs find the source of life-giving water and experience the meaning behind Poseidon’s nickname of Earth Shaker. excerpt: I can’t remember whether I screamed or not. If I did, the sound was lost in the thundering of rock and water. With a wrenching, grinding roar, the steps heaved upwards, throwing me heavily into the tunnel wall. A second violent convulsion pitched me downward onto my knees, back toward the well’s chamber, and I slammed the opposite wall with shoulder and chest as I toppled. Instinctively, I wrapped both arms around my head, expecting a rain of stone at any second. The earth roared and heaved again, and a heavy, struggling weight landed on me, driving the breath out of my lungs as it slid: Morgan. I twisted frantically and clutched at him to check his downward plunge: failed, and felt my forearm explode into pain and numbness as it caught the edge of a flailing boot. That quickly, he was gone, lost in the rush of cold water that surged over me. The deafening blast of the well-turned-fountain and the rumble of stone grinding against stone muted suddenly as water filled my ears and pulled me down.